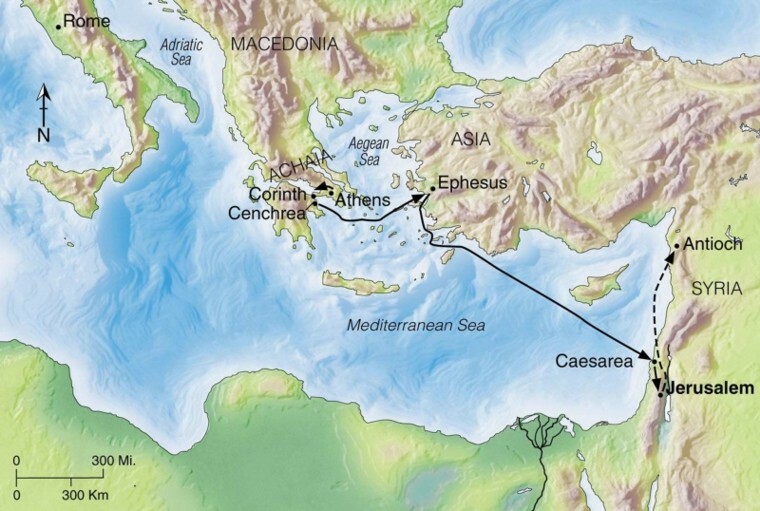 Paul left Athens, and went to Corinth, which was 46 miles away. He met with Aquila and Priscilla there, who had come from Italy after the Roman emperor Claudius had ordered all Jews to leave Roman (we know this to have been issued in 49 AD). At that time, they made no distinction between Jews and Christians. Aquila and Priscilla were tent makers by trade, like Paul, and he stayed with them. They became faithful friends, and he mentions them again a few times in Scripture (Romans 16:3-5, for example). As always, he reasoned in the synagogue every Sabbath, preaching Jesus as the Christ. But when they opposed him, he went to the home of Titius Justis, about whom we know nothing. Crispus, the ruler of the synagogue, was one of the Corinthians that we know Paul baptized himself (1 Corinthians 1:14). Paul left Athens and traveled on to Corinth, one of the greatest commercial centers of the empire, located on a narrow neck of land offering direct passage between the Aegean and Adriatic seas. When Paul left from the port of Corinth at Cenchrea, he visited Ephesus. He then traveled to Caesarea, from where he went on to Jerusalem to report on his trip before returning to Antioch. The Lord spoke to Paul in a vision, telling him to keep teaching, and that no harm would come to him there. So he remained for a year and a half (verse 11). The proconsul was the chief judicial officer. In this case, it was Gallio (verses 12-14) that held that position when the Jewish leaders there, in a united assault, had Paul brought before the tribunal. We know from fragments of a letter from Claudius (the Delphi Inscription, found in 1905 by a French expedition) that he began this office in 51 AD. He was a brother of the philosopher, Seneca, who was an advisor to Nero. Born as “Marcus Annaeus Novatus”, he took the full name “Lucius Junius Gallio Annaeus,” after the rich man who adopted him.But before Paul could defend himself, Gallio ruled that this was a religious matter between the Jews and ran them out of the tribunal. Sosthenes, who was beaten in verse 17, may have succeeded Crispus after he became a Christian. Sosthenes may have become a Christian himself, and could be the same one mentioned by Paul in his first letter to the Corinthians (1 Corinthians 1:1), but we do not know for sure. At Corinth’s eastern port of Cenchrea, Paul had cut his hair at the completion of a vow (likely a Nazirite vow, as in Numbers 6:2). It is speculated, that Paul would have kept some of his observances of ceremonial law, which would not be inappropriate at all. He would not, however, bind such on others. Paul then set sail for Syria, taking Priscilla and Aquila with him. Stopping to establish the church at Ephesus, he left Priscilla and Aquila there, promising to return “if God wills.” He then set sail to Caesarea, traveled to report to the church in Jerusalem and up to Antioch of Syria, ending his second missionary journey in verse 22. Verse 23 then begins Paul’s third missionary journey, going up though Galatia and Phyrgia, “strengthening all the disciples” at the churches he had begun. Paul’s third journey began in Acts 18:23. He hurried north, then west, returning to many of the cities he had previously visited. 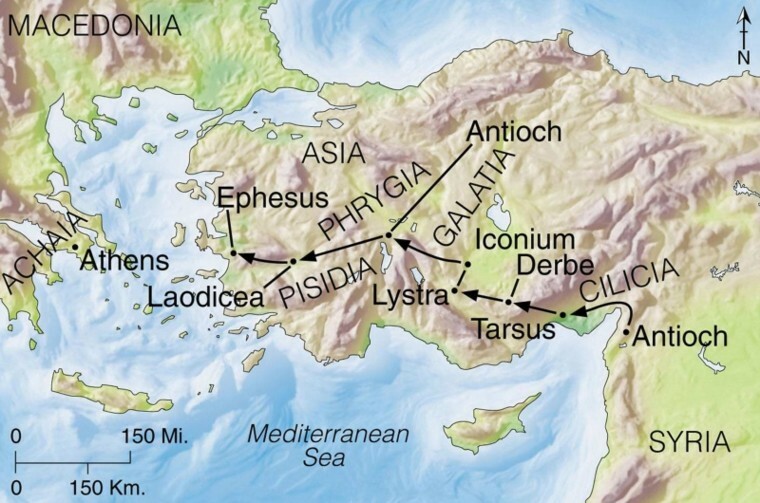 This time, however, he stayed on a more direct westward route toward Ephesus. Meanwhile, a Jew named Apollos came to Ephesus from Alexandria. He was a learned and eloquent man, well-versed in the Old Testament. Luke says that “he spoke and taught accurately the things concerning Jesus, though he knew only the baptism of John,” meaning that he taught accurately what he knew, but Aquila and Priscilla filled in for him, teaching him “the way of God more accurately.” It is likely that Aquila baptized him into Christ. Wishing to go into Achaia, he was encouraged by the brothers, and became a powerful speaker of the gospel. Side note: A modern photo of the port of Cenchrea can be found in this article at Ferrell’s Travel Blog.